The traditional dress of the Uyghur people is deeply intertwined with both their history as traders along the Silk Road and their devout belief in Islam. 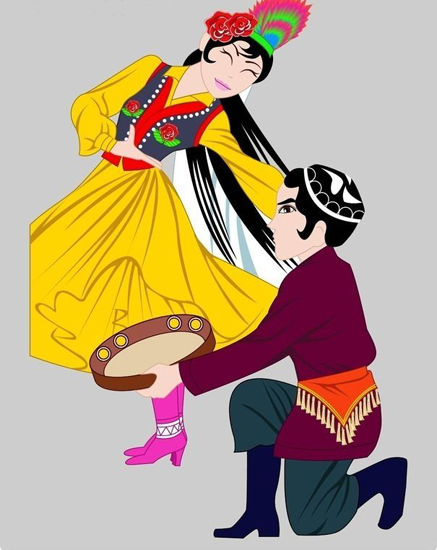 In particular, two pieces of clothing have become symbolic of the Uyghur ethnic minority: the chapan and the doppa. The chapan, a variant of the caftan, is a long coat that is worn over the clothes during the winter months. It is typically worn by men and comes in a variety of colours, from muted blues to fiery reds. Intricate patterns are embroidered on the exterior and, instead of buttons, the chapan is bound by a large cloth band around the waist. The doppa is a square or round skullcap that is worn not only by the Uyghurs but also by the Kazan Tartars, the Uzbeks, and the Tajiks. The cap itself is usually black or white, although other colour variants do exist, and it is traditionally embroidered with vibrantly colourful patterns, much like the chapan. Older Uyghur men are known to grow long beards and wear a much taller version of the doppa, which is fringed with fur at the bottom. While men sport the chapan, women wear exquisitely embroidered long-sleeved dresses that billow out at the waist. Popular embroidery motifs include vines, pomegranates, moons, arabesques, and geometric patterns. Golds, reds, and blacks are the most popular colour combinations, although pinks, greens, blues, purples, and even tie-dyes also feature. To complement these luxurious dresses, Uyghur women don plenty of jewellery, including large earrings, bracelets, and necklaces. Young girls tend to braid their hair in a number of long plaits, as this is regarded as a symbol of feminine beauty, while married women usually wear two plaited pigtails affixed to the head with a crescent-shaped comb. Although it is still reasonably uncommon, some women will wear the veil in-keeping with their Islamic faith. Both men and women wear silk slippers or leather boots, depending on the season and the occasion. From shimmering satins to rich silk threads, the opulence of the Uyghurs’ traditional dress is undeniable!